This Indoor/ Outdoor Combo has a manageable 9'10" height which makes it truly portable entertainment. Young guests will come flocking to spend time in the large jumping area, shoot some hoops, or challenge each other through the pop-up obstacles. An always-entertaining climb and slide rounds out the combo fun, designed for hours of healthy physical play. Suitable for both indoor and outdoor events, and offers 360-degree, high-visibility mesh for easy viewing. Constructed of lite n' strong fire resistant vinyl for added safety, durability and easy portability. 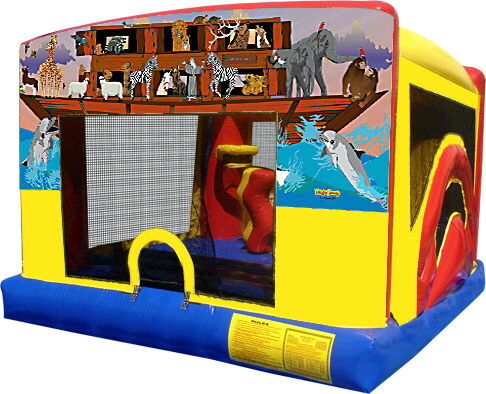 * Please call us for any questions on our noahs ark toddler zone bouncer combo rentals in Rocky Mount and Wilson NC.